On 01/07/19 generated a�Bearish CCI Opportunities�signal at the entry price of�42.94. After�30�days, the latest closing price is 38.69. 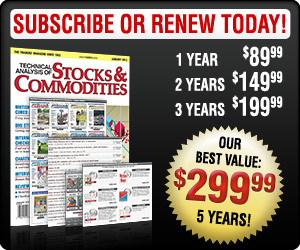 The current return for�iPath S&P 500 VIX Short-Term Futures ETN�is�9.90%. It is currently a�winning�trade. After two weeks of trading, iPath S&P 500 VIX Short-Term Futures ETN had returned�9.83%�on investment.�After a month,�9.90%. The trade is currently open. iPath S&P 500 VIX Short-Term Futures ETN�is�a�9.90%�gain. The trade is currently closed. iPath S&P 500 VIX Short-Term Futures ETN�was�a�24.80%�gain. The trade is currently closed. iPath S&P 500 VIX Short-Term Futures ETN�was�a�-6.51%�loss. The trade is currently closed. iPath S&P 500 VIX Short-Term Futures ETN�was�a�-5.94%�loss. The trade is currently closed. iPath S&P 500 VIX Short-Term Futures ETN�was�a�1.18%�gain. On 11/02/18 generated a�Bearish MACD Opportunities�signal at the entry price of�36.68. After�96�days, the latest closing price is 38.69. The current return for�iPath S&P 500 VIX Short-Term Futures ETN�is�-5.48%. It is currently a�losing�trade. The trade is currently closed. iPath S&P 500 VIX Short-Term Futures ETN�was�a�1.80%�gain. The trade is currently closed. iPath S&P 500 VIX Short-Term Futures ETN�was�a�-7.73%�loss. On 09/11/18 generated a�Bearish CCI Opportunities�signal at the entry price of�29.14. After�148�days, the latest closing price is 38.69. The current return for�iPath S&P 500 VIX Short-Term Futures ETN�is�-32.77%. It is currently a�losing�trade. After two weeks of trading, iPath S&P 500 VIX Short-Term Futures ETN had returned�8.48%�on investment.�After a month,�-16.75%. The trade is currently closed. iPath S&P 500 VIX Short-Term Futures ETN�was�a�-0.10%�loss. The trade is currently closed. iPath S&P 500 VIX Short-Term Futures ETN�was�a�-7.60%�loss. The trade is currently closed. iPath S&P 500 VIX Short-Term Futures ETN�was�a�3.63%�gain. The trade is currently closed. iPath S&P 500 VIX Short-Term Futures ETN�was�a�-5.35%�loss. The trade is currently closed. iPath S&P 500 VIX Short-Term Futures ETN�was�a�-5.06%�loss. The trade is currently closed. iPath S&P 500 VIX Short-Term Futures ETN�was�a�6.42%�gain. The trade is currently closed. iPath S&P 500 VIX Short-Term Futures ETN�was�a�-7.25%�loss. The trade is currently closed. iPath S&P 500 VIX Short-Term Futures ETN�was�a�-13.16%�loss. The trade is currently closed. iPath S&P 500 VIX Short-Term Futures ETN�was�a�4.50%�gain. The trade is currently closed. iPath S&P 500 VIX Short-Term Futures ETN�was�a�7.94%�gain. The trade is currently closed. iPath S&P 500 VIX Short-Term Futures ETN�was�a�-6.43%�loss. The trade is currently closed. iPath S&P 500 VIX Short-Term Futures ETN�was�a�-9.50%�loss. The trade is currently closed. iPath S&P 500 VIX Short-Term Futures ETN�was�a�9.13%�gain. The trade is currently closed. iPath S&P 500 VIX Short-Term Futures ETN�was�a�8.33%�gain. The trade is currently closed. iPath S&P 500 VIX Short-Term Futures ETN�was�a�-5.98%�loss. The trade is currently closed. iPath S&P 500 VIX Short-Term Futures ETN�was�a�8.16%�gain. The trade is currently closed. iPath S&P 500 VIX Short-Term Futures ETN�was�a�9.07%�gain. The trade is currently closed. iPath S&P 500 VIX Short-Term Futures ETN�was�a�1.88%�gain. The trade is currently closed. iPath S&P 500 VIX Short-Term Futures ETN�was�a�-4.15%�loss. The trade is currently closed. iPath S&P 500 VIX Short-Term Futures ETN�was�a�-6.97%�loss. The trade is currently closed. iPath S&P 500 VIX Short-Term Futures ETN�was�a�-7.12%�loss. The trade is currently closed. iPath S&P 500 VIX Short-Term Futures ETN�was�a�2.93%�gain. The trade is currently closed. iPath S&P 500 VIX Short-Term Futures ETN�was�a�-9.07%�loss. The trade is currently closed. iPath S&P 500 VIX Short-Term Futures ETN�was�a�-4.75%�loss. The trade is currently closed. iPath S&P 500 VIX Short-Term Futures ETN�was�a�-6.57%�loss. The trade is currently closed. iPath S&P 500 VIX Short-Term Futures ETN�was�a�3.55%�gain. The trade is currently closed. iPath S&P 500 VIX Short-Term Futures ETN�was�a�-10.88%�loss. The trade is currently closed. iPath S&P 500 VIX Short-Term Futures ETN�was�a�-156.30%�loss. The trade is currently closed. iPath S&P 500 VIX Short-Term Futures ETN�was�a�-23.66%�loss. The trade is currently closed. iPath S&P 500 VIX Short-Term Futures ETN�was�a�-5.69%�loss. The trade is currently closed. iPath S&P 500 VIX Short-Term Futures ETN�was�a�-6.77%�loss. The trade is currently closed. iPath S&P 500 VIX Short-Term Futures ETN�was�a�23.57%�gain. The trade is currently closed. iPath S&P 500 VIX Short-Term Futures ETN�was�a�-5.36%�loss. On 03/25/14 generated a�Bearish MACD Opportunities�signal at the entry price of�43.81. After�1779�days, the latest closing price is 38.69. The current return for�iPath S&P 500 VIX Short-Term Futures ETN�is�11.69%. It is currently a�winning�trade. After two weeks of trading, iPath S&P 500 VIX Short-Term Futures ETN had returned�-2.15%�on investment.�After a month,�6.41%. The trade is currently closed. iPath S&P 500 VIX Short-Term Futures ETN�was�a�31.68%�gain. On 03/19/14 generated a�Bearish CCI Opportunities�signal at the entry price of�43.40. After�1785�days, the latest closing price is 38.69. The current return for�iPath S&P 500 VIX Short-Term Futures ETN�is�10.85%. It is currently a�winning�trade. After two weeks of trading, iPath S&P 500 VIX Short-Term Futures ETN had returned�5.55%�on investment.�After a month,�3.89%. The trade is currently closed. iPath S&P 500 VIX Short-Term Futures ETN�was�a�31.04%�gain. The trade is currently closed. iPath S&P 500 VIX Short-Term Futures ETN�was�a�-5.95%�loss. The trade is currently closed. iPath S&P 500 VIX Short-Term Futures ETN�was�a�-8.66%�loss. The trade is currently closed. iPath S&P 500 VIX Short-Term Futures ETN�was�a�-8.51%�loss.